The Vodafone Warriors turned Horse Whisperers in their round 13 match-up with the Brisbane Broncos running away with a 36-18 victory at Mount Smart Stadium. The boys were granted a free licence and they took it with both hands. Right from Albert Vete’s first hit up you could clearly see that the team’s attitude had vastly improved. The attitude and commitment shown from the playing group in this match has been something the fans have been begging for since the beginning of the season. No longer did this side look lost in attack. The forwards were chewing up the metres through the middle allowing Issac Luke to get a roll on from the play the ball causing the broncos to constantly be on the back foot. With the forwards dominating the battle up front, Shaun Johnson finally had the room to attack the line and be the devastating attacking player that he is known to be. Everything seemed to work for the Warriors in this game, from the bounce of the ball to most of the offloads sticking and in what was a welcome change we were even awarded those 50/50 calls from the referee. They gave themselves plenty of attacking opportunities and after 21 minutes they were 18-0 up after some clever plays from Shaun Johnson, scoring a try himself and setting Bodene Thompson up for another, Jacob Lillyman scored the third from a nicely placed grubber from Issac Luke. We've seen many games where this side would have folded in the past but two minutes into the second stanza the Warriors were over again through an amazing diving try by David Fusitu’a. The NZ based side scored three more tries through Ryan Hoffman, David Fusitu’a who bagged himself a double and Solomone Kata. Brisbane could only manage two more tries to Jordan Kahu and Tevita Pangai but the Broncos were never in this match and were possibly lucky to only have lost 36-18. The line speed shown from the home team was the best I have seen for month’s, maybe even years, missed tackles were few and far between and importantly those silly errors and penalties that have plagued this side this season were gone. My player of the day goes to Shaun Johnson, with the forwards doing the hard yards up front he had free reign in this game and he took full advantage. An attacking Shaun is a dangerous Shaun and the fans will be hoping that this version is here to stay this season. Have things started to click with the Warriors? Did Konrad Hurrell’s exit last week help realign this team as a unit and/or perhaps the players open honesty session last week helped the players get onto the same page. In all honesty, I think it’s a little from column A and a little from column B. Whatever was said in the honesty session seems to have helped this team actually buy into what this club is trying to become. Does this mean that the season is saved? No, possibly not. This is just a step in the right direction and the team needs to continue to bring the right attitude each and every week. 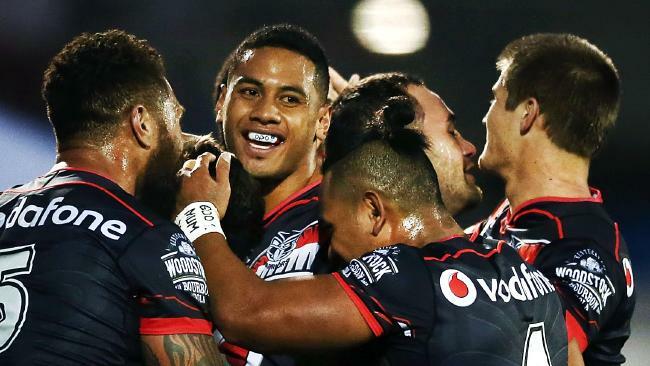 The Warriors face the Newcastle Knights in Round 14. Although the Knights have only managed the one win this season, the Warriors cannot afford to let their guard down. Their current points differential is not going to do them any favours come seasons end if they stay deep in the negatives so they really need to put some big performances in to bring them into contention with the top 8.